A customer brought in this lamp the other day and it had stopped working. This small lamp had a touch control module on the bottom no longer functioning. For this lamp repair we will replace the touch control lamp switch. 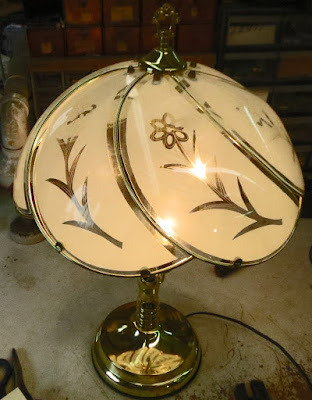 As with any repair, the first step is to unplug and inspect the lamp. We are looking for cracks, bends, snags in the cord, polarized lamp plug. This lamp checks out so the touch control switch should be the only lamp part we need. First, we need to remove the shade. This shade comes off after removing the top finial. The shade is put in a safe spot. Now we turn the lamp over and locate the touch control. This touch control has the low, medium, high, and off controls. You can tell this by the White, Red, and Black wires. We need to make sure the new control attaches to the same wires so we are going to replace one at a time. Starting with the white wire from the control switch, we remove the old clamped wire nut and rewire our new white cord to our new touch control switch. Next we wire the red wire from the control switch. Same method is used: remove old wire nut, tighten the stranded wires and replace the wire nut. Next the black wire is attached using the same technique. The final wire is the yellow wire. This attaches to the lamp body and senses the touch. To save some time, we are only going to connect the new yellow wire to the old yellow wire. We simply cut the old yellow wire, strip it, and connect it to the yellow wire on our new control switch using a wire nut. The new control switch is wired to the lamp. We can mount the control box with the peal and stick tape on the back of the switch. The old touch switch can be discarded. We are ready to test the lamp. We plug it in and start to touch or tap the lamp body. Great! Now we replace the shade the same way it was removed. Another lamp repaired and saved from a landfill.